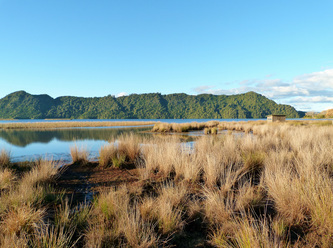 ﻿Landcare Ōkareka was formed in May 2003 following the opening of the Lake Ōkareka Walkway in February 2003. A group of locals who were interested in assisting Rotorua District Council to look after the recently opened walkway came together with this task in mind. The Steering Committee was formed and spent some time working out what the vision statement and goals for Landcare Ōkareka would be. Lake Ōkareka is a popular residential and recreational area. The native bush and rural environment, along with access to the lake, reserves and lakeside walkway, all offer a range of lifestyle and recreational opportunities for both local residents and visitors. People enjoy and value the natural beauty and abundant wildlife of this area. In 2004 Landcare Ōkareka were nominated for a Trustpower “Spirit of Rotorua” award, and won the Heritage and Environmental category. 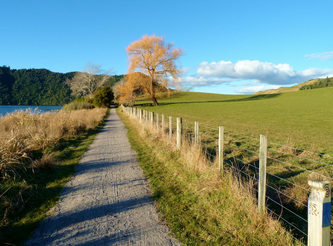 To begin with the main focus of Landcare Ōkareka was on the Lake Ōkareka Walkway. There was a lot of work to be done with numerous plantings undertaken, weed control, mulching, and so on. Landcare Ōkareka along with Rotorua District Council prepared a very successful funding application to Environment Bay of Plenty Environmental Enhancement Fund. This was to carry out a much needed upgrade to the walkway to wheel chair and push chair standard to Silver Beach, along with the construction of disabled accessible composting toilets, a shade structure, a bird hide in the wetlands, safety edging along the boardwalk and numerous new seats. Along with all of the track and building work there were also many more plantings undertaken. Plants have mainly been provided by Rotorua District Council and Environment Bay of Plenty. There have also been significant donations of plants from various nurseries over the years. In recent years, Landcare Ōkareka volunteers are carrying out less plantings along the walkway, with most areas now planted out and growing well. We are very pleased with the wonderful growth on the specimen pohutukawa trees along the walkway, which were planted back in 2005. We are also very pleased with the growth of the rata trees donated by Project Crimson, and planted in 2010. There has also been the creation of a Remembrance Grove planting area along the walkway. An area available for local Ōkareka property owners and residents to plant trees to commemorate various human events such as births, marriages, anniversaries and deaths. In the last few of years, the focus of Landcare Ōkareka volunteers has been shifting from the Lake Ōkareka Walkway to other areas around the Okareka village. Weed clean up and planting of road bank between walkway entrance and Longfords farm entrance. Massive weed clean up at Lake Ōkareka Scenic Reserve, above and around the pump station, assisted by Guy Gaddum's kind donation of use of a digger and mulching head for 2 days. Area is now replanted in native plants also to help with mistletoe regeneration. Working Bees are usually held on the 4th Saturday of each month, from 9 am to 12 noon. Look for the sign boards. We welcome anyone who would like to come along and help. This is an opportunity to meet other residents of Ōkareka, and make a difference to our environment.